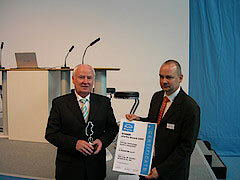 On 14 October 2009, Bender GmbH & Co. KG received an award in the category of Storage technology/System integration at eCarTec 2009 – the 1st International trade fair for electric motive power in Munich, Germany. The award covers electric motive power and particularly applies to the electrification of the drive train since electric drives offer a huge potential for decreasing the dependence on oil imports and reducing CO2 and local pollutant emissions. MunichExpo Veranstaltungs GmbH has arranged this award on the occasion of eCarTec for the first time in order to promote the technology of electric motive power. Bender GmbH & Co KG received the award for a measuring device for monitoring the insulation in drives for electric and hybrid vehicles. With its new modular insulation monitoring device, A-ISOMETER® iso-F1, Bender has succeeded in developing a highly effective protective measure against electric shock. The iso-F1 monitors the state of the insulation between the active conductors of an electrical drive system (Un = DC 0-1000 V) and the measurement earth (vehicle chassis). With this patented method of measurement, the insulation state of the entire high voltage system of an electrically powered vehicle is monitored and any insulation faults are reliably reported. The system is an optimised, highly advanced technological solution for monitoring the insulation of the entire electrical drive system. Because it is small (only weighing 50 g) and uses an optimised measurement technology in comparison to conventional measurement methods and other versions which are available on the market, the A-ISOMETER® iso-F1 is the best solution available for use on electric vehicles. This intelligent measurement method measures the entire system including the battery, active frequency inverter and the drive motor during highly dynamic conditions such as accelerating and braking. The process is insensitive to interference either from high inverter frequencies or large HV fluctuations. The unit also meets the high demands of the extreme environmental conditions which have to be taken into consideration on vehicles. These include temperature extremes (-45°C to 125°C), vibrations, electromagnetic compatibility and high-voltage strength. Thus, the new A-ISOMETER® iso-F1 offers the best features in order to provide the basic safety equipment for the generations of electric and hybrid vehicles which will appear in the not-too-distant future.